A full documented history of how and when your problem began will be taken, along with any relevant past medical history, medication, and the effect on either your social or working life. 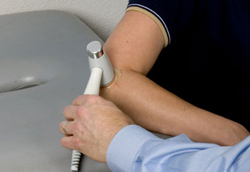 The physiotherapist will then observe your posture and range of movement, whilst undertaking any specific tests necessary to assist in the diagnosis of your problem. An explanation of your condition, anatomy involved and the healing process will be in a manner you can understand but you may ask questions at any time. The physiotherapist will advise regarding appropriate home care and exercise to help facilitate pain relief and a graduated return to function. Sam has experienced exercise programmes across a wide spectrum, from early remedial activity following surgery or a flare of arthritis, to targeted regimes for elite athletes. These are all techniques that can ease discomfort whilst restoring range of movement and function. A “hands on” approach is the “bread and butter” of one to one physiotherapy treatment, and can give you the reassurance that your problem has been identified and addressed. Electrotherapy can assist in the healing process when used appropriately by your therapist. 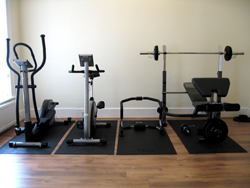 In clinic we have class leading equipment serviced annually for your piece of mind. I have been practicing acupuncture for over 10 years now, and have regularly seen the benefits this historic treatment can provide. Slender, sterile needles are inserted in appropriate areas of the body to initiate a healing response and provide pain relief. This treatment can be requested or will be advised by your therapist if they feel it is appropriate. Time served on the wards, in consultant clinics and regular out-patient physiotherapy departments, has given me the experience to address the fears and physical difficulties that arise when undertaking surgical intervention. Procedures will be explained in plain English, and appropriate home care and exercise regimes advised. Treatment in clinic will be specific to your needs.